Dream Dogs Professional Training — Specialty Programs for fun and new skills for both of you to learn. Unique classes to challenge you both. Looking for a new challenge for you and your pooch? Come show off your current skills, and learn some new ones while having fun with your dog. We recommend that you and your dog complete our Basic Obedience class before signing up for a specialty program, or get prior approval from a Dream Dogs staff member. Requirements: Pre-registration is required for all specialty programs. Your dog needs to wear a flat collar or harness with a nylon leash. For the safety of all participants (human and canine), we do not allow flexi-leads or prong collars. All dogs must be current on vaccines. Please bring proof of current vaccinations to your first class. BARN HUNT - Coming Soon! Barn Hunt is a sport that is sweeping the nation, in which your dog finds rats in PVC tubes hidden on a course made from bales of straw or hay. Sound intriguing? This class will be available at the end of January or the first part of February 2019. This exciting class consists of obstacle courses that you and your dog complete together. Up a ramp, over jumps, through a pool of balls, and into a tunnel…all while you and your pup are focusing on your teamwork and having fun. Each course is completed on leash, allowing dogs of all training abilities to join in. Don't miss out on all the fun! We recommend you and your dog complete our Basic Agility class before taking this mini-clinic so your dog is comfortable working on the equipment. Take your dog’s obedience skills to the next level. You’ll build a better bond with your pup by learning techniques to keep your dog’s focus and attention on you, all while playing and having fun! Teach your dog how to behave nicely out in public. 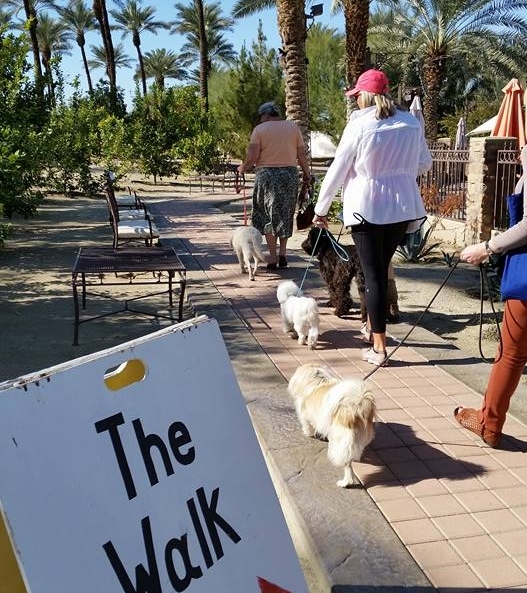 Using real-life situations throughout Palm Desert and La Quinta, we focus on safe leash work for busy streets, curb training, stays, and building confidence in new places. If you want to be able to take your dog to a restaurant without being embarrassed or stressed out during your meal, this is the class for you. We also test for the Urban Canine Good Citizen (CGC) certification on week five. Learn the fast track sport of rally obedience (Rally O), which consists of 51 behaviors that you and your dog perform on a course that differs every time you run it. Rally O helps build your dog’s attention and leash work skills while strengthening the owner/dog bond. Note: The first week’s class is for HUMANS only; please leave your dogs at home. Even our oldest and dearest companions need a few new skills. Come have some fun with your old buddy learning some new fun tricks, games and drills designed to keep your older pet young at heart. This is a 6 week course that will focus on the skills needed in the Therapy Dog world. We will test for the Canine Good Citizenship Award. The CGC is a 10 step test. All dogs, including purebreds and mixed breeds, that pass the CGC Test will receive a certificate from the American Kennel Club. We will build on your dog’s obedience skills and learn new ones including go see, paws up, keep close, crawl, up, pretty/beg, and leave it. We will also help you discover your own dogs’ tolerance level for the multitude of therapy dog options and help place you in the right organization to go to work as a therapy dog team.